Well. I agree with Ann Coulter. On Wednesday, Donald Trump unfollowed Coulter on Twitter following an interview she gave to the Daily Caller in which she said, “Trump will just have been a joke presidency who scammed the American people” if he doesn’t keep his promise to build a border wall. That’s more or less been the point of his presidency all along, which Coulter has always understood. Ever since Trump descended the escalator in Trump Tower to the fury of Neil Young’s solo in “Keep on Rockin in the Free World” and declared within the first two minutes of his candidacy announcement, that Mexico wasn’t “sending their best”—that “they’re rapists” (yep, that was the phrase)—he was Coulter’s guy. She more than anyone knew exactly what the right-wing voters that would ultimately comprise the MAGA movement—what you could call “the base of the base”—wanted, and she predicted from the first that Trump would win. At the time Coulter sounded insane, but far-right politics is the only arena where Coulter really does know what she’s talking about. 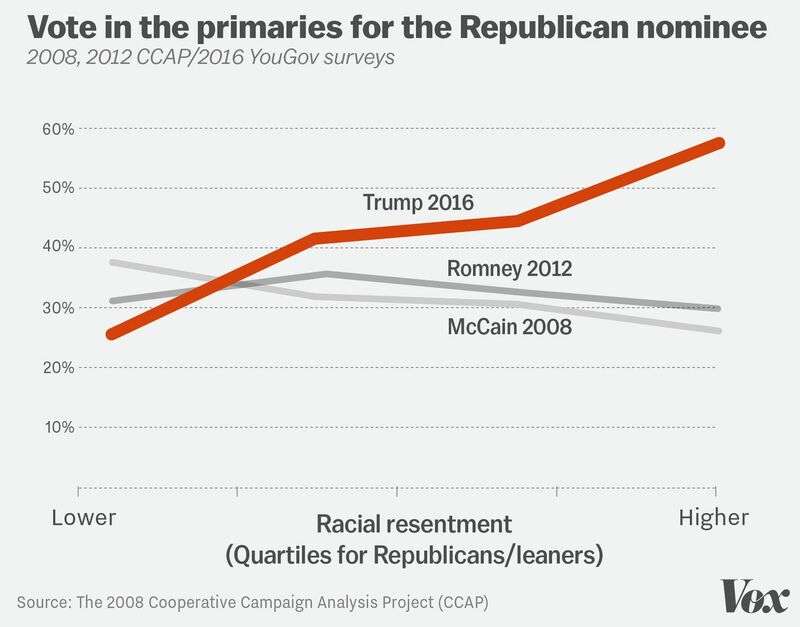 Here’s the one chart you need to see in order to understand why Trump won the nomination, and because of that, the election: He uniquely consolidated the most despicable GOP voters. 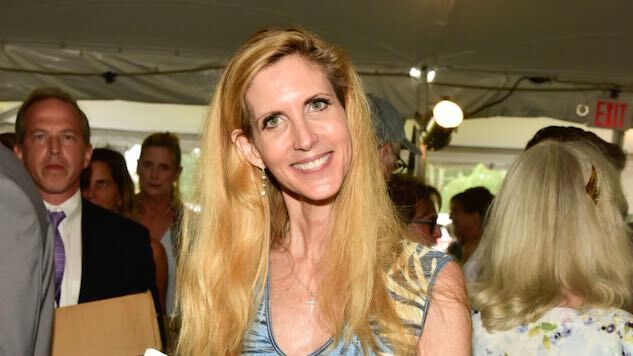 Until now, of course, the hyper-conservative racist crab (Coulter, not Trump) had been willing to let the president’s painfully obvious and pervading hideousness slide if she and her race-war retinue of which she fancies herself the intellectual leader got what they wanted out of him. That wasn’t necessarily the wall, per se. (The wall wasn’t part of his original platform, but an impromptu campaign promise Trump immediately recognized was a winner.) The base of the base (I’d guess this is about 25% of the voting population) really wants Trump to stop all immigration and arrest, imprison, and deport millions of people. Trump’s promise of a massive, “beautiful,” contiguous border wall was a brilliant metaphor, a bonding agent they now can’t do without. For these people, it’s the one promise he needed to keep, but after two years of a GOP-controlled congress, he failed them. Now that a Democrat-controlled House guarantees Trump won’t ever make good on his immigration promises, Coulter has dropped all pretense. She sounds like a member of the resistance. And that’s the most interesting thing: Coulter voiced critiques of Trump that liberals have been blasting from day one, namely that he’s incompetent and corrupt. The same day Coulter blistered Trump in that interview, she published a scathing philippic on her Geocities-era blog that laid out her critique in colorful detail. And I can’t believe I’m typing this, but it’s worth giving up column space to quote Ann Coulter at length, because her post—a right-wing critique of Trump—is essentially a handbook for Democratic communication strategy (and a possible primary challenger) in 2020. So ignoring the fact that Coulter is upset because she believes Trump hasn’t gone far enough, these quotes should all sound familiar. The Washington Post loves to find the one crazy, trailer park lady who supports Trump because she’s had religious ecstasies about him, but most people who voted for him did so with a boatload of qualms…. Note that Coulter doesn’t touch on Russia—she’s actually dismissive of it—and won’t even concede he committed crimes. She focuses on his abject incompetence and pathological dishonesty. In the end, all Trump would need to do in order to get re-elected is post a picture of him in front of a couple miles of shining new wall in the deadly Arizona desert. He didn’t even need to get Mexico to pay for it. Hell, his base has raised millions of dollars to pay for it themselves. That’s how much they care, and that’s how stupid he’s been to shelve the promise. And if his base takes the cue from leaders like Coulter—whom Laura Ingraham immediately seconded on Twitter—they’ll turn their backs at this most cutting of betrayals. It’s doubly stupid for Trump because his coalition of the cruel has been his only leverage over the mainstream GOP: the GOP feared that if they ever crossed Trump, he could turn more than half of their voters against them, which come 2020 would ultimately split the party. Turns out these voters weren’t even tied to Trump: They were tied to the wall, and everything it represented. Now Trump seems to have brought about the very thing the GOP sold its soul for two years to prevent, and it risks destroying the party. It’s possible they cut and run, though other recent developments indicate that’s not likely. Though admittedly this is fringe stuff, we live in the era of the long tail of politics, where the fringe combined outweighs the center. If their support for Trump diffuses, he’s done, and fittingly it wouldn’t be Stormy Daniels, or Russia, or all the corruption and crimes that brought him down. It would just be Trump being Trump.